Here's a WORMWORX 3000L Gravity Wastewater Treatment System we installed at The Patch, VIC. This is a new-build project which will be using recycled shipping containers for the entire house construction; so we are quite excited to see this project roll out. My client contacted Zenplumb as he was in search of a wastewater system that reflected the same ethos of low-impact, environmentally conscious design. The vent-riser for this WORMWORX system will be installed later, adjacent to the house in a concealed location, as a decking will be built over the WORMWORX system. The deck will include an access hatch to allow my client to add his food scraps to the worm colony. In making his selection, my client also wanted a system that did not require the three year pump-out sequence which a standard Septic system calls for. This system's greatest qualities are in its simplicity; no moving parts, just a healthy microclimate of worms and aerobic microbes working together through the mutualistic relationship of aerobic digestion. This property has a beautiful ephemeral creek at the rear boundary. Therefore, his chosen system runs through a Sand Filter for Secondary Treatment; to achieve 20/30 wastewater purification. The final stage of recycling continues through a Subsurface Irrigation Field of 230m2 on contour. Here's a WORMWORX 3000L Gravity Wastewater Treatment System Zenplumb installed at Warragul, VIC. This was a new-build project and my client wanted a low-input, environmentally passive wastewater system that did not require the three year pump-out sequence which a standard Septic System calls for. This system's greatest qualities are in its simplicity; no internal moving parts, just a healthy microclimate of worms and aerobic microbes working together through a mutualistic relationship of aerobic digestion. Here's a WORMWORX 3000L Gravity Wastewater Treatment System Zenplumb installed at Callignee, VIC. My client needed to upgrade her old Septic System. Wanting to do things differently, she searched for an environmentally friendly solution to recycle her property's effluent. She had heard of the power of worms, and their ability to unlock the nutrient potential found in effluent. Worms have proven to passively process up to 97% of suspended solids in wastewater. The aerobic bacteria, also hosted within the WORMWORX system, process the rest. 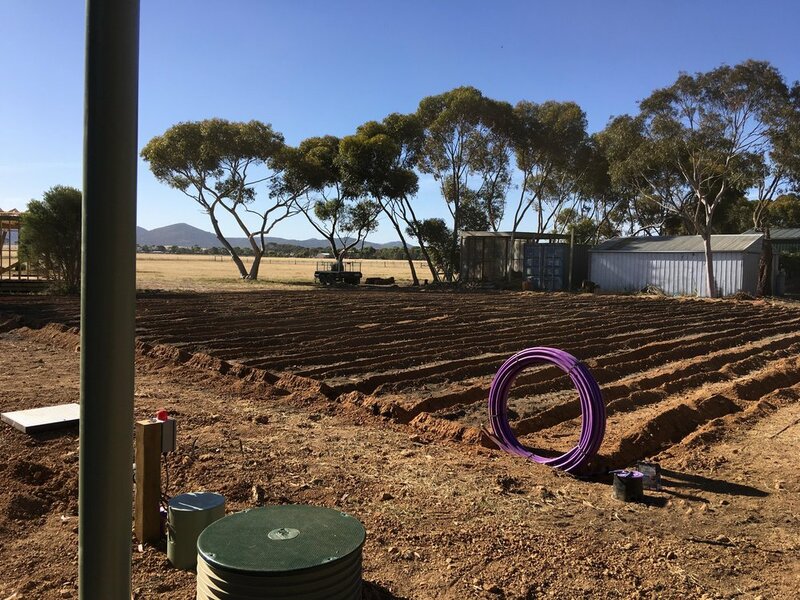 This system also runs through a Sand Filter to achieve Secondary Treatment; which then continues to recycle through the property via a Subsurface Irrigation Field of 482m2.